The only piece of equipment on the Shimada I haven’t told you about is the box corer. Jason Phillips has been using the box corer to collect, well, box cores. Box cores are samples of the bottom of the ocean or sea floor (also, seabed). The box core is lowered to various depths (400 m, 300 m, 200 m, 100 m and 60 m), then survey technicians, Jaclyn Mazzella or Phil White, open the jaws of the machine and scoop up a mouthful of whatever is on the bottom, including benthic (referring to bottom of the ocean) creatures. Once surfaced, Jason subsamples the sediment, sand, mud, small pieces of rocks and debris, removing just a small part of it and storing it until our return to land. Subsampling allows scientists to measure a manageable amount and then generalize about the larger remainder; while this is limiting because it assumes uniformity throughout the box core, the alternative is looking through each piece of sediment individually, something that is time and cost prohibitive. However, he does invest the time necessary to pick out all the creatures collected by the box corer. Back at his lab, Jason will analyze the sediment, and then he or a colleague will identify all the tiny, tiny organisms, living things, found in the core. Below, you can see Jason processing the core. He has washed down the smaller pieces of sediment like clay and sand through the holes in the mesh sieve. 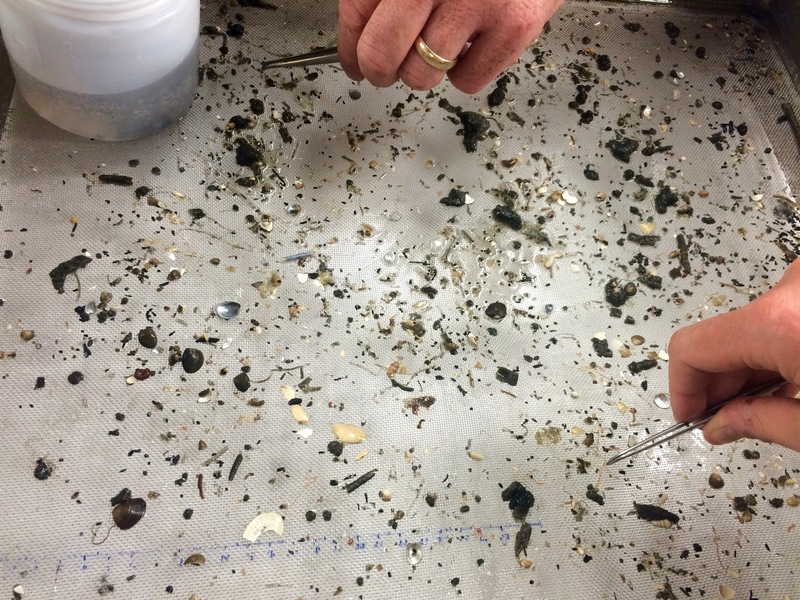 The sieve traps the smaller pieces of rock and even smaller animals, allowing him to pick them out and place them into preservative for processing when he returns to shore. Jason and Amanda pick out benthic organisms from a core sample. 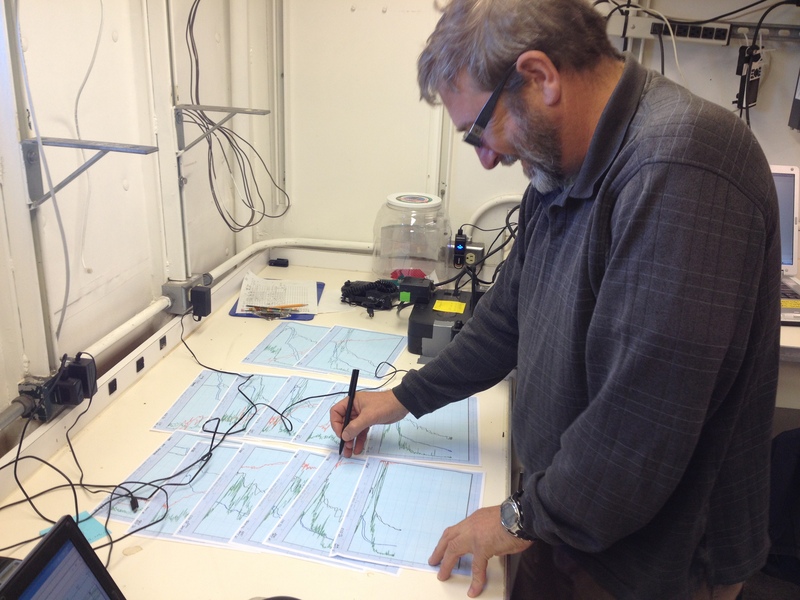 Because he has been collecting this data for two years, there are some patterns emerging about sediment conditions in different areas of the seabed. This information may help inform the placement and construction of a proposed wind farm off the Oregon coast. For at least one day of our cruise, Jason also put out hooked long-lines to try and catch albacore, a type of tuna. Unfortunately, the fish weren’t biting. While albacore are unique among most tuna in that they prefer cooler water, Jason says the late-spring waters off the Oregon coast are still a little too cold for them and since they can swim up to 100 miles a day, they can easily find some more comfortable temperatures. The albacore that have been caught on previous cruises as part of this ongoing study are being tested for radioisotopes that may have originated from the Fukushima-Daiichi nuclear disaster of 2011. And, of course, there’s always fun to be had on the Shimada. Below you can watch a video of Jason unearthing a pupa utility-worm from one of his box cores; scientific name (Travisia pupa), affectionately known as the “stink worm.” Will decides we need a closer, um, look. Tyler Jackson, a Master’s student at Oregon State University has been working on fisheries genetics since he was an undergraduate. His interest in marine science began when he was a wee recreational fisherman’s son growing up on the US-Canada border in Port Huron, MI. In collecting megalopae, a larval form of Dungeness crab, he is trying to determine how closely related the Dungeness crab of areas off the Oregon coast are. He has studied population genetics among adult Dungeness crabs along the West Coast. He hypothesizes that if adult crabs in an area are closely related, larvae settling in the nearshore would be too. However, he tells me that it is not well understood how crab larvae travel throughout the ocean, and then for some to make it back to nearshore and settle to the bottom, maybe near where they came from. Perhaps these extended families get scattered throughout the seas, perhaps not. At the first few stations, the tows were not bringing back enough individuals to give Tyler a large enough sample size to provide a reliable assessment of whether the crabs in that part of the ocean are related or not. Unfortunately, on this cruise Tyler did not get a sample size large enough to use. 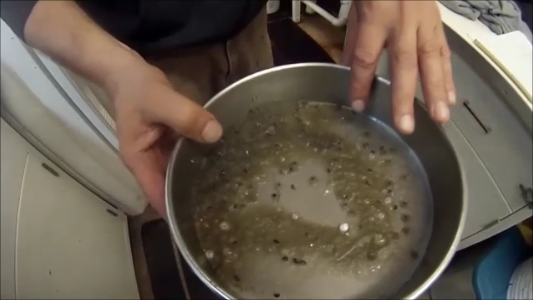 In the following video you can see that, after sieving the neuston, Tyler found two Dungeness megalopae (too small of a sample size to test) but quite a lot of red rock crab megalopae. These little creatures are fascinating and pretty adorable. I also interviewed Tyler about his work and life at sea. You can hear our talk below. 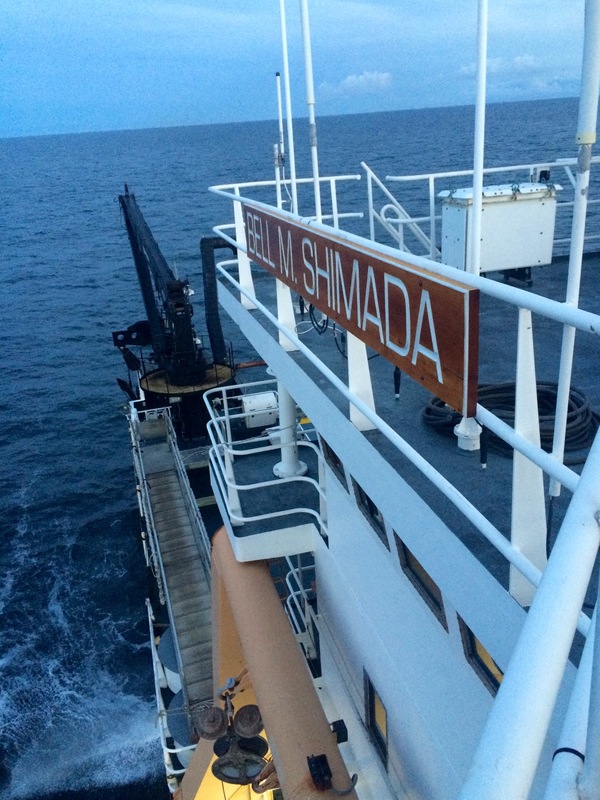 Two nights ago, I couldn’t sleep at all, and I was thinking about the fact that my time on the Shimada is quickly coming to a close. I was trying to find a way to get even more information from the scientists on board to you. Taped interviews seemed like the perfect solution. I began conducting them yesterday and, after finishing three, realized I’d spoken to three of the four other women of the science crew. And so, here we are having a conversation about gender equity in the sciences. Using data from a longitudinal study done by the National Science Foundation, in 1973, 88% of doctorate holders working at the university level in life sciences (includes marine biology) were male, just 12% were female. Hearteningly, women have become much more well represented in the life sciences; in 2010, these numbers were 58% and 42%, respectively‡. You can see this same kind of near gender balance on board the Shimada: of the twelve (counting me) members of the science crew, five are women. Women are also well-represented in this blog post. You can see the numbers breakdown for all the science and engineering fields here. 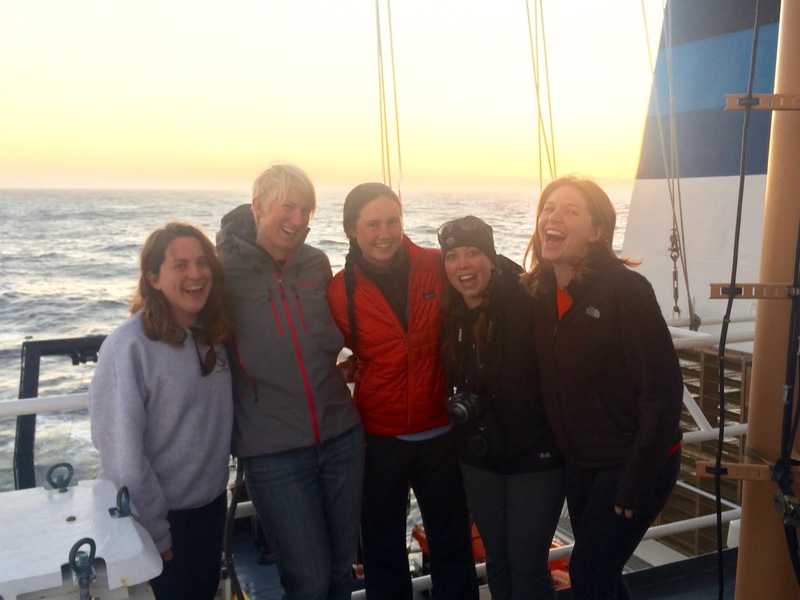 I interviewed the four other women of the science crew about their research and life on board the ship, as well as being a woman in the field of life science. You can hear those interviews below. If you would like to find the parts of the conversations about gender equality in marine science, you may use the time stamps below. ‡Compare this to the numbers for the physical sciences, in 1973, 95% of doctorates employed in academia were male, compared to 5% female; in 2010, 79% male to 21% female. Why are there still so few women in science? What can be done to encourage girls to pursue, and stay, in STEM fields? Find our location in real time HERE! Neuston Net and Manta Tow Today, the weather is pleasant but the sea seems more than restless. The show must go on! 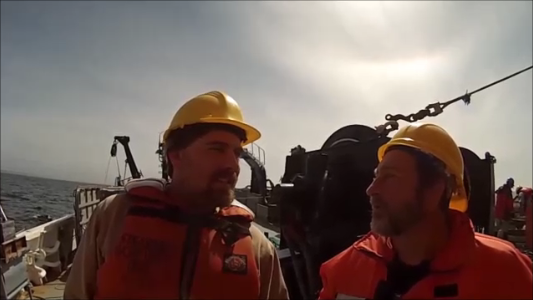 I step onto the open deck behind the wet lab just as Dr. Curtis Roegner, a fisheries biologist with NOAA, is placing a GoPro onto the end of an extensive net system. While Curtis specializes in the biological aspects of oceanography, he is especially interested in the synthesis of the ocean system and how bio aspects relate to other physical and chemical parameters. 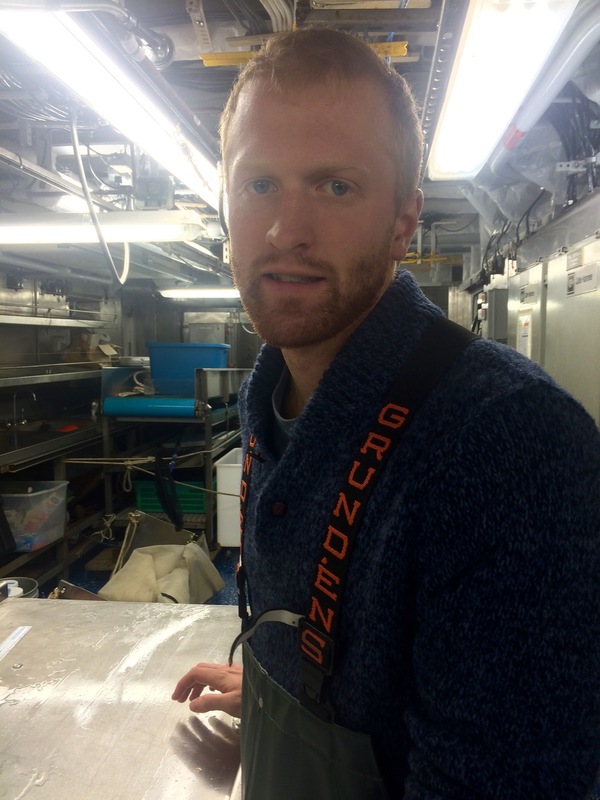 He joins this cruise on the Ocean Starr as he continues a long-term study of distribution patterns of larval crabs. The species of focus: Cancer magister, the Dungeness crab; a table favorite throughout the Pacific Northwest. While I have been known to eat my weight in “Dungies”, I realize that I know very little about their complex life cycle. We begin with “baby crabs”, or crab larvae. Once they hatch from their eggs, they quickly join the planktonic community and spend much of their 3-4 month developmental process adrift – at the mercy of the environmental forces that dictate the movement of the water and therefore, govern the journey of these young crustaceans. It has been generally assumed that all planktonic participants float wherever the waters take them. In that context, it makes sense that we have been finding large numbers of larvae miles offshore during our nighttime trawl sorting. Still, not all are swept out to sea. Every year millions make their way back into the shallows as they take their more familiar, benthic form which eventually grows large enough to find its way to a supermarket near you. The question is: How? How do these tiny critters avoid being carried beyond the point of no return? Is it luck? Or is there something in the evolutionary history of the Dungeness crab that has allowed it to adapt to such trying conditions? Curtis tells me about recent research that suggests that seeming “passive” plankton may actually have a lot more control of their fate than previously supposed. By maneuvering vertically throughout the column they can quite dynamically affect their dispersal. Behavioral adaptation may trigger vertical migration events that keep them within a particular region, playing the varied movement of the water to their advantage. 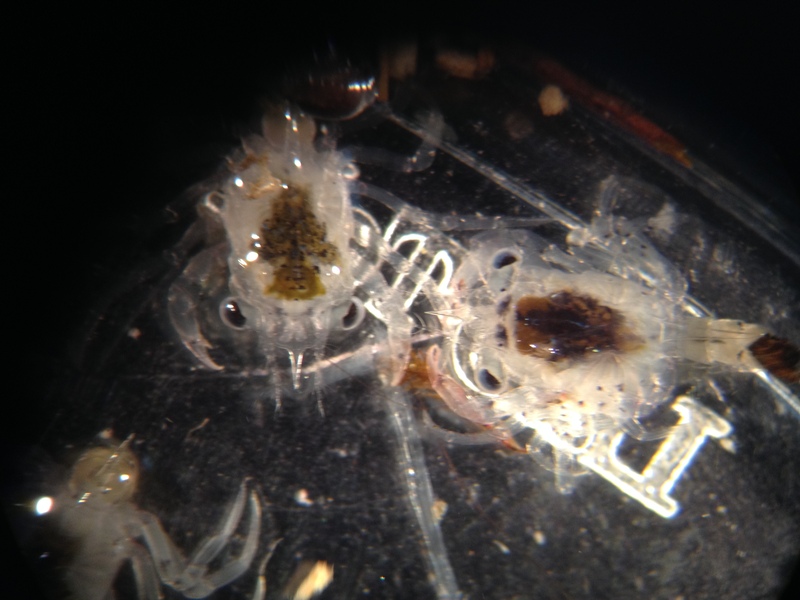 Curtis believes the answer to what determines Dungie abundance lies with with the Megalops, the final stage of the larva just prior to true “crab-hood”. By the end of this stage they will have made their way out of the planktonic community and into estuaries of the near shore zone. This continued study is important in predictably marking the success or failure of a year’s class of crab recruitment. That is to say, the more Megalopae that return to a region, the better the promise of a strong catches for the crabbing industry – and a better chance for you and me to harvest a crab or two for our own table! As Curtis and I discuss his research, he continues preparing his sampling equipment. 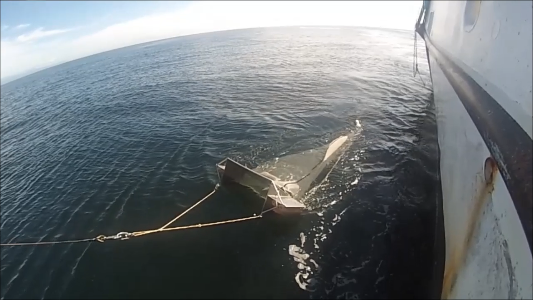 The instrument looks similar to the plankton nets we use in marine science at SAMI only it’s about ten times longer and its “mouth” is entirely rectangular, unlike the circular nets I am used to using. I’ve heard the terms “manta”, “bongo” and “neuston” being tossed around lab and yet I am unable to discern one from the other. It’s time I got some answers! Curtis explains that the Megalopae he wants to catch are members of the neuston, the collective term given to the community of organisms that inhabit the most surface layer of the water column. The Neuston net is named simply for its target. It occurs to me that a “plankton net” is a very general term and that they can come in all shapes and sizes. In addition, the mesh of the net can vary drastically in size; the mesh on our nets at school is roughly 80µm, while the mesh of this net is upwards of 300μm (1 µm or micrometre is equivalent to one millionth of a metre). The manta body design for neuston sampling. A specialized plankton tow. I’m still confused because I am fairly certain I have heard others refer to the tool by another name. Curtis explains that while any net intended to sample the surface layer of the water column may be referred to as a neuston net, this particular net had a modified body design which deserved a name of its own. The “manta” is a twin winged continuous flow surface tow used to sample the neuston while minimizing the wake disturbance associated with other models. The net does seem to eerily resemble the gaping mouth of a manta ray. These enormous rays glide effortlessly through the water filtering massive volumes of water and ingesting anything substantial found within. On calm days, our metallic imposter mimics such gracefulness. Today however, it rides awkwardly in the chop, jaggedly slicing and funneling the surface layer into its gut. It’s all starting to make sense. Not only is this a plankton net designed to sample plankton, it is also a plankton net designed to sample only the neuston layer of the planktonic community. The modified body sitting on buoyed wings designed to cover a wider yet shallower layer at the top of the water column further specified the instrument; a neuston net towed via manta body design for optimized sampling. Got it. After the tow is complete, Curtis dumps the cod end of the net into a sieve, showing me an array of critters including more than a dozen Megalopae! Two samples are frozen to ensure analysis back at the Hammond Lab in Astoria. There, Curtis will examine the developmental progress of the Megalopae in relation to the suite of data provided by the CTD at each testing site. This information, along with various other chemical and physical data will be cross-examined in hopes of finding correlation – and perhaps even causation – that make sense of the Dungeness crabs’ biological and developmental process. Fundamentally, a CTD is an oceanographic instrument intended to provide data on the conductivity, temperature and depth of a given body of water. 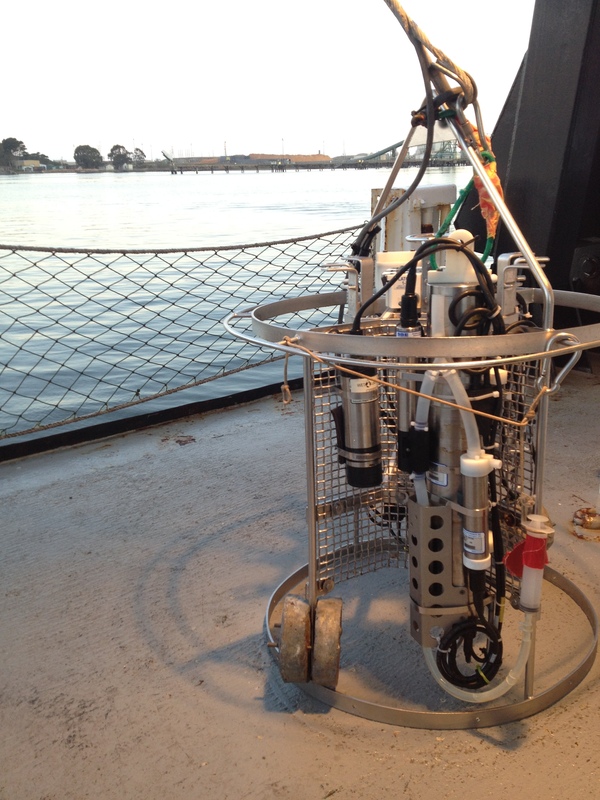 The CTD is one of the most common and essential tools on board a research ship. Whether it’s Jason exploring benthic communities, Sam hunting jellies, or Curtis collecting crab larvae, all can benefit from the information the CTD kit and its ensemble of auxiliary components can provide about the quality of the water at a given test site. In general, the more information we collect with the CTD the better our ability to map various chemical and physical parameters throughout the ocean. Check out the TAScast below as I give a basic overview of and take a dive with the CTD and its accessories. Just when I thought I was beginning to get the hang of it…. Hold on, I have to lie down. As I mentioned above, the seas have been a bit rougher and I’ve been going through a phase of not-feeling-so-hot for the first time this trip. It’s odd because we hit some rougher ocean right out of Eureka and it didn’t seem to faze me much. I stopped taking my motion sickness medicine a few days in, and though I’ve picked it back up just in case, I’m not entirely convinced it’s the only contributing factor. I think it has more to do with my transition onto the night shift and all the plankton sorting which requires lots of focus on tiny animals. The night before last was particularly challenging. In the lab, all of the papers, books and anything else not anchored down slid back and forth and my body felt as if it were on a giant swing set and seesaw all at once. In addition, each time I looked out the back door all I could see was water sloshing onto the deck through the very drainage holes through which it was intended to escape. I remember wondering why there were so many rolls of duct tape strapped to the table and why chairs were left on their side when not in use. Well, now I know. Earlier today we made a quick pit stop in Newport, Oregon – home of the Hatfield Marine Science Center as well as NOAA’s Marine Operations Center of the Pacific. In short, this is where NOAA’s Pacific fleet of vessels is housed and the home base to several members of my science team, including Chief Scientist, Ric Brodeur. 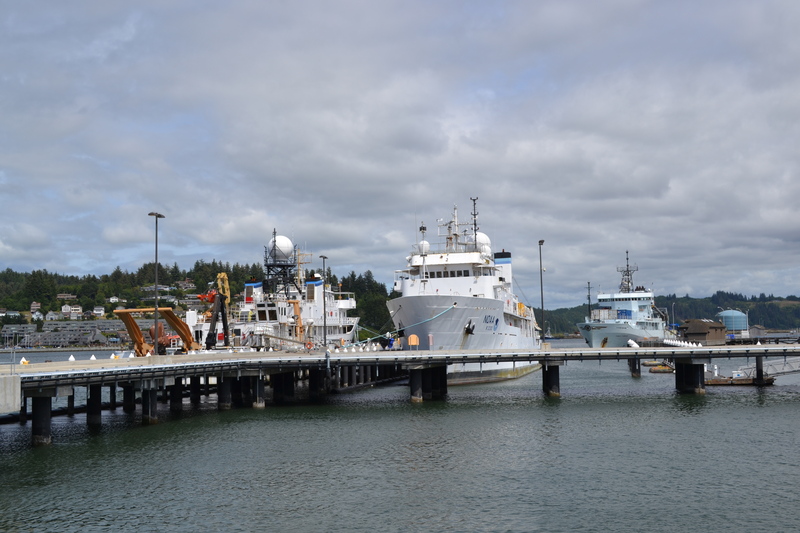 The NOAA Pacific fleet at rest in Newport, OR. I remember the anticipation of seeing the R/V Ocean Starr, a former NOAA vessel, for the first time. Growing up in Hawai’i, I remember these enormous ships making cameo appearances offshore, complete with a satellite dome over the bridge, only imagining the importance of the work done aboard. Now here I was, walking amongst the giants I idolized as a kid – the difference being that my view was up close and personal from behind the guard gate, a member of their team. I’m totally psyched even though I attempt to pretend like I’ve been there before. As much as I could have spent all afternoon admiring, I needed to make the most of our two hour layover in the library uploading blog material. Unfortunately the satellite-based internet is incredibly finicky out at sea. It’s a first world problem and understandably a part of life at sea, I realize, but all the same, I apologize to all those anticipating regular updates. I continue to do the best I can. I can say, however, that the Hatfield Marine Science Center boasts a fantastic library. I look forward to exploring the rest of the facility upon my final return in a little over a week. ‘Till then, BACK TO SEA!